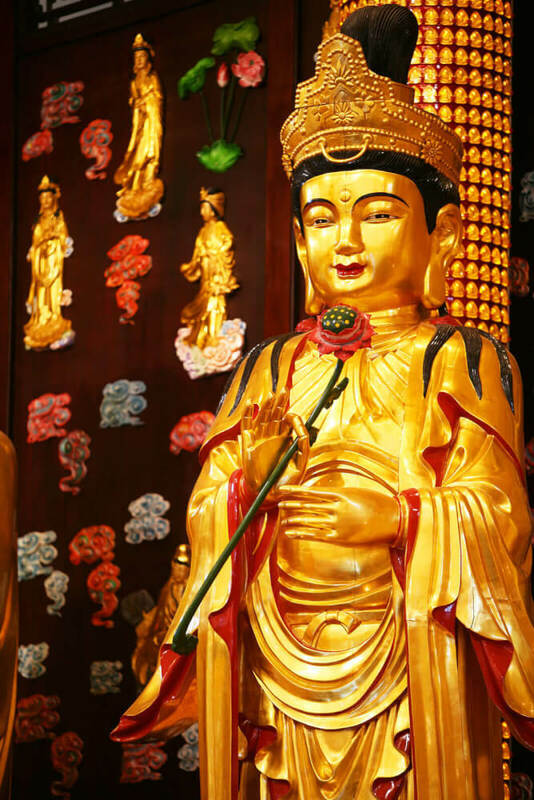 The unique attributes of the Buddha and Bodhisattva statues at the temple remind us to cultivate the virtues and noble qualities that they embody. Every sentient being has the Buddha nature, and the potential to become a Buddha. We can all free ourselves from the sufferings of life and death. Many in the past have done so by realizing their own Buddha natures, and thereby have become a Buddha. 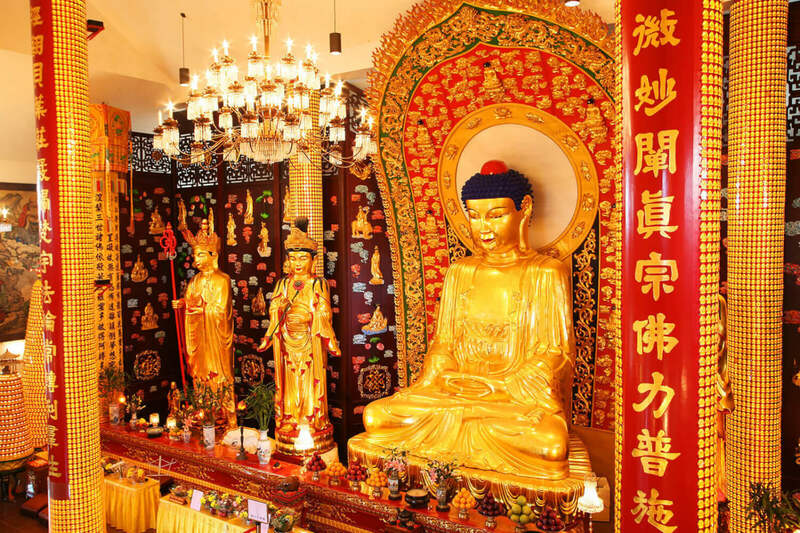 Each of those Buddhas has an inspiring story of their path to enlightenment. 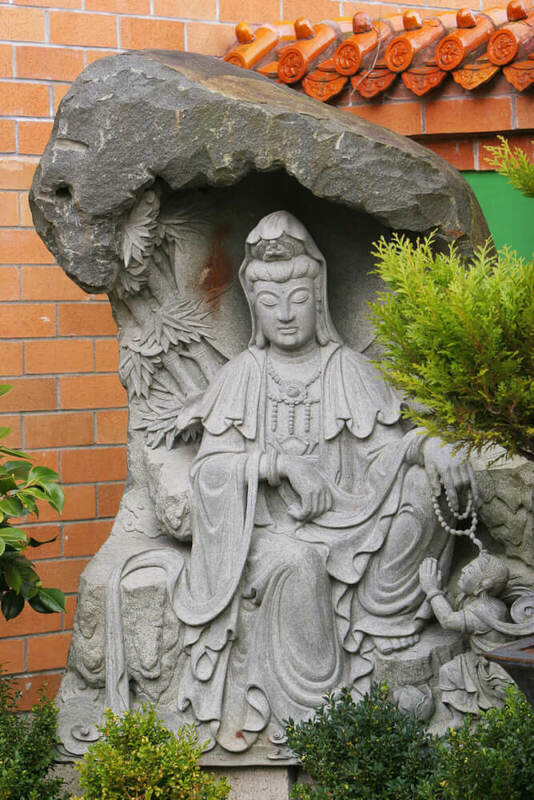 At the International Buddhist Temple, various Buddhas and Bodhisattvas are depicted by master artists in the forms of sculptures and paintings. These works of art help us be mindful of the characteristics and vows of the many Buddhas and Bodhisattvas. This statue has been in the temple’s Main Gracious Hall since 2002, and is the largest Buddha statue in North America. It is approximately 35 feet in height, from the bottom of the lotus base to the top of the aura. The statue is made of camphor wood and colored with gold leaf. The Avalokitesvara Bodhisattva is the Bodhisattva of Compassion. This Bodhisattva has one thousand hands and one thousand eyes, and has been here since our establishment. 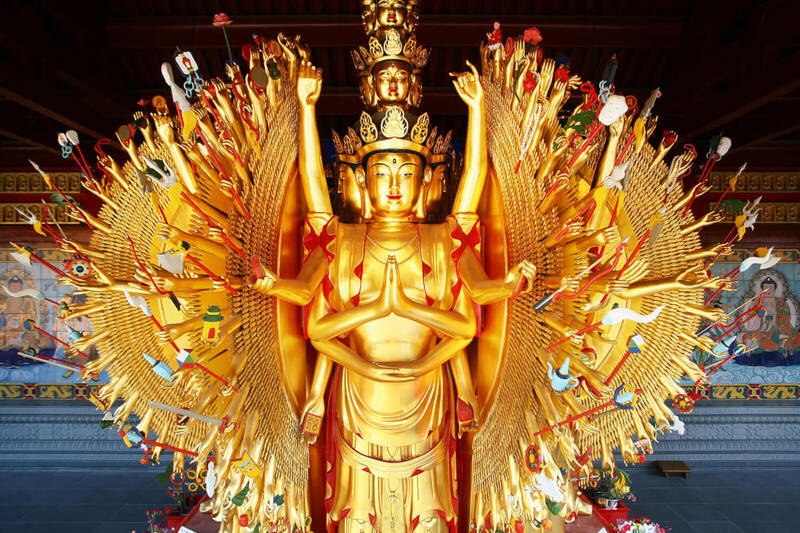 There is also an Avalokitesvara Bodhisattva with ten thousand hands and ten thousand eyes in the Seven Buddha Pavilion of Worshipping Square, or our main courtyard. Each hand and eye symbolizes the Bodhisattva watching over humankind and protecting them from harm. The Ksitigarbha Bodhisattva vowed not to attain Buddhahood until He frees all people in all realms from suffering (human realm, inferno realm, etc.). Buddhism is not a faith of idolatry. We could have Buddhist temples without images of Buddha. However, artistic renderings create a point of focus for the learning Buddhist. They provide inspiration and encouragement for everyone to obtain the highest form of spiritual liberation what Buddhists refer to as Enlightenment.